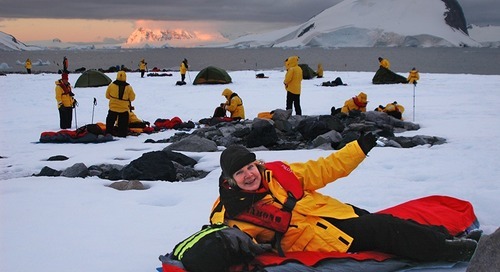 Once you’ve booked your polar expedition, it’s time to start thinking about how to pack and what you’ll need to take, to be ready for anything throughout your trip! Luggage weight is a factor on all commercial airlines, and even moreso when you’re taking a Fly-Cruise expedition with a charter flight. We have the best inclusions in the business, so you don’t have to worry about packing large, bulky items like a parka, waterproof boots or even a water bottle--that’s all provided. But what else should you bring for your time on board, to keep you comfortable, warm and dry throughout your expedition? The key is to remember that expedition travel is fun… you can leave the stiff formal wear at home! How should I dress for life onboard? When you’re on expedition, you could be sitting down to dinner one minute and running to the deck to see a pod of whales nearby the next! Temperatures on the decks will range from below freezing to warm enough to stand out in a t-shirt, depending on the region and the current wind, snow or rain, and sunlight conditions. hanging out in your room checking email, unloading your camera or enjoying a brief rest and recharging your batteries for your next adventure. The key is to be ready for anything. Your captain, crew, Expedition Leader and guides are constantly on the lookout for seabirds and marine life while you’re at sea, and all kinds of wildlife as you cruise close to shore. In fact, you’ll typically find an expedition team member in the bridge anytime you visit. It’s an awesome experience to see them at work, and they love sharing their knowledge about what you’re seeing, hearing and experiencing. The crew will let you know where you can stand and observe in the bridge, to give you a fantastic insider look at how a small expedition ship operates, while ensuring everyone’s comfort and safety. How should I dress for the lounge and dining room? Dress comfortably and casually onboard, always in layers so you can quickly adjust to temperature changes. This includes meals, which are an informal affair. Our guests range from 20 to 80 years old (with the occasional family with young children) and come from all corners of the world--it’s a diverse group of adventure seekers, each with their own unique fashion sense. Passengers enjoy dinner in the Ocean Diamond dining room. Photo: Antarctic Explorer photojournal, December 2016. The food is fantastic and the service stellar, but it is an expedition ship and comfort comes first. You don’t want to have to run back to your room for warmer clothes when that intercom announcement comes on that there are belugas just up ahead! "Nice" for an expedition is a collared shirt, not a tuxedo. It’s important that all passengers wear closed toe, non-slip shoes at all times on the ship--even during dinner. Flip-flops, slippers, sandals and slippery soles (ballet shoes, in particular) just aren’t safe in the hallways, or out on the decks. Some Expedition Leaders and guests prefer shoes with no laces that slip on, so long as they have a heel for safety and good arch support. Dock shoes are another popular type of footwear onboard. And don’t worry, no one will find it impolite if you hang your light jacket or sweater over the back of your chair during dinner, or have it with you in the lounge or lecture hall. Laundry service is available on each expedition ship at a reasonable cost, and passengers have told us that airline baggage fees typically exceed laundry costs. Plan on packing fewer items and using laundry service. In general, the name of the game on a polar expedition ship is to be as comfortable and safe as possible until it’s time to gear up and head out on another Zodiac cruise, shore landing or adventure activity like kayaking. Still have questions about what to bring on your polar expedition?